Recibido pago. 1ra. share cobrada. 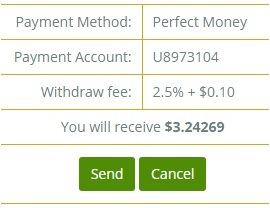 W3Adz +3.05 Received Payment 3.05 USD from account U12040808. Memo: You have received funds from the CAN Group, please post your payment proof in the related forum. Todavía faltan algunas shares de comprar que estoy esperando de unas PTCs que paguen. Received Payment 3.24 USD from account U12040808. Memo: You have received funds from the CAN Group, please post your payment proof in the related forum. 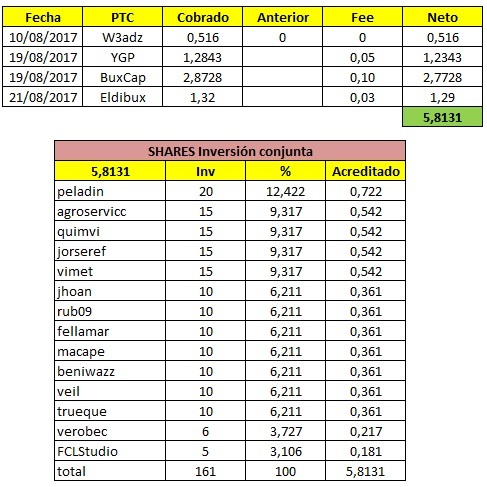 Comprado 2 shares más en BuxCap, que es la que más rinde y está pagando. Comprado 1 share en W3adz. Cro Media +1.56 Received Payment 1.56 USD from account U6179953. Memo: You have got money from EldiBux. Please, post your proof of payment on the forum. Thank you for your support. Amigo peladin has descubierto el truco del almendruco !!! Para eso estamos, para ganar en equipo. Received Payment 3.98 USD from account U12040808. Memo: You have received funds from the CAN Group, please post your payment proof in the related forum.